This is the impressive new BMW 2 Series Active Tourer which sees the German carmaker introduce front wheel drive and three cylinder engines for the first time. It’s only slightly longer than the BMW 1 Series but this vehicle manages to feel more spacious and comfortable on board and it has a lot of clever design and practical ideas which are all packaged together to make a great car. This is the second member of the BMW 2 Series range, the other choice is a coupe, but this Active Tourer has very little in common with its stablemates. As you would expect from this firm, the new BMW 2 Series Active Tourer has a very strong driving experience which is also sporty with incredible efficiency. Even though this is the firm’s first front wheel drive car, the Active Tourer still manages to retain the sporty characteristics that are now associated with the BMW style. One reason for the sporty performance is the development of a new front wheel drive system which manages to succeed in balancing agility and comfort which is what buyers in this segment are looking for. In addition, the chassis is newly developed too and has a long wheelbase, a wider track and a reduced friction steering system. BMW have also added the option of electronically controlled dampers which will adjust the chassis for different driving situations to help improve driving dynamics. The car is ideal for urban driving with the BMW 218i SE having a top speed of 124 mph and it will reach 0 to 62 mph in 9.3 seconds. Its combined economy is 57.6 mpg and has emissions of 115g/km. 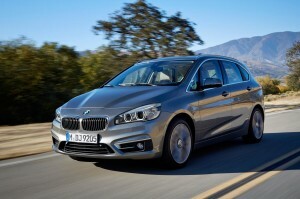 The BMW 218de SE has a slightly better top speed of 127 mph and will reach 0 to 62 mph in 8.9 seconds. More impressively it should return around 69 mpg on the combined cycle and has emissions of just 109g/km, though it’s interesting to see that BMW says the economy figures may vary depending on ‘driving style and conditions’. BMW has given its 2 Series Active Tourer a sporty look and improved its aerodynamic efficiency; there’s a vertical air-deflecting aeroblade on either side of the rear window and a rear spoiler. The interior for the new BMW 2 Series Active Tourer is quite impressive and it’s not only comfortable for five people but it also feels very spacious, helped by the large amount of glass to ensure the cabin remains light and airy. The seating position for the driver and front seat passenger is higher than that found in the usual BMW saloon which gives a better all-round view and makes a vehicle easier to get in and out of. Later this year, a more powerful 225i engine will go on sale with xDrive four-wheel-drive along with more models for the Active Tourer range. This entry was posted in Car Leasing, Cars, Family Car, New Cars and tagged 2 Series, bmw, BMW 2 Series, lease the BMW 2 Series by Steve Lumley. Bookmark the permalink.